Talk about saving things for a rainy day! I like having things in the freezer for really lazy days or days when I want to rustle up food with little or no effort or effort spread over. Cookie dough, sponge cake, muffins, crepes, puff pastry, ladyfingers, custard sauce, ganache and the kind. Fresh warm cookies in a flash, muffins to throw in the kids’ snack box on that mad morning or just that little bit of custard sauce for that dessert as a finishing touch. Or some sponge cake to make a no effort trifle when you need dessert but all the work you want to do is whip some cream. You would probably imagine I have a huge freezer stacked with labeled boxes. Yes! It’s just that way – featuring prominently in my culinary fantasies! ( Hubby has no doubts whatsoever that I will feed the family solely out of the freezer if I had one big enough) But wait, I make an effort and space in my smallish freezer so that I have at least one or two of these. The poor things need to jostle for space amongst the ice trays, packets of yeast, boxes of whipping cream, mint chutney, pizza sauce, nuts, cardamom and precious almond meal you see. The sponge barely in one piece struggling to get out of the freezer is perfect for a trifle. Put together with whatever else is available. 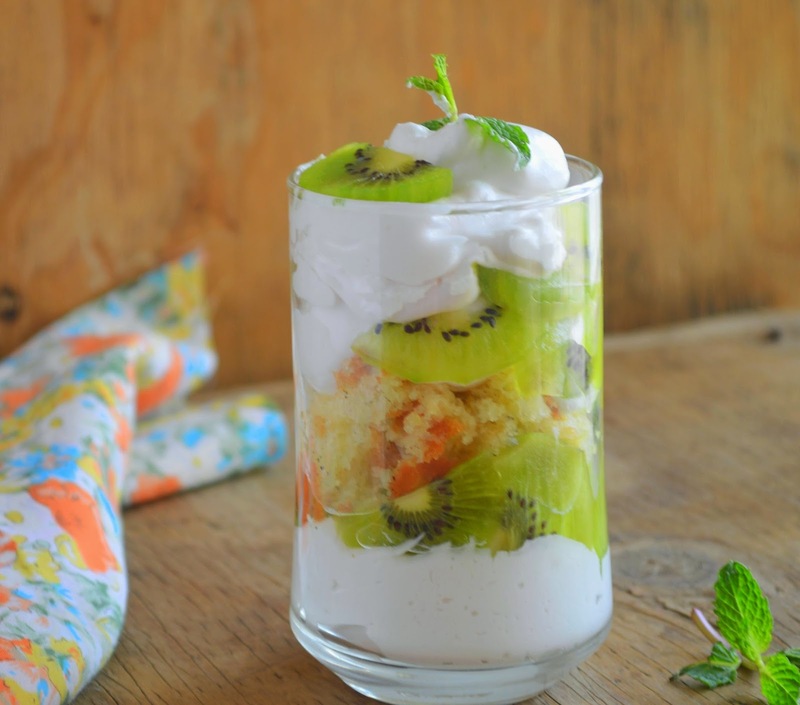 Kiwi and fresh cream, with bits of a broken sponge came in handy on this rainy…oops sunny day! The sponge of course was a plain fatless vanilla sponge again (please don’t roll your eyes, you will break my heart). Since I wanted it lemony, I have soaked it in a mildly tangy syrup. You can make the sponge with lime zest of course. The cream could be simple vanilla whipped cream or one with lime zest, or cream and mascarpone. 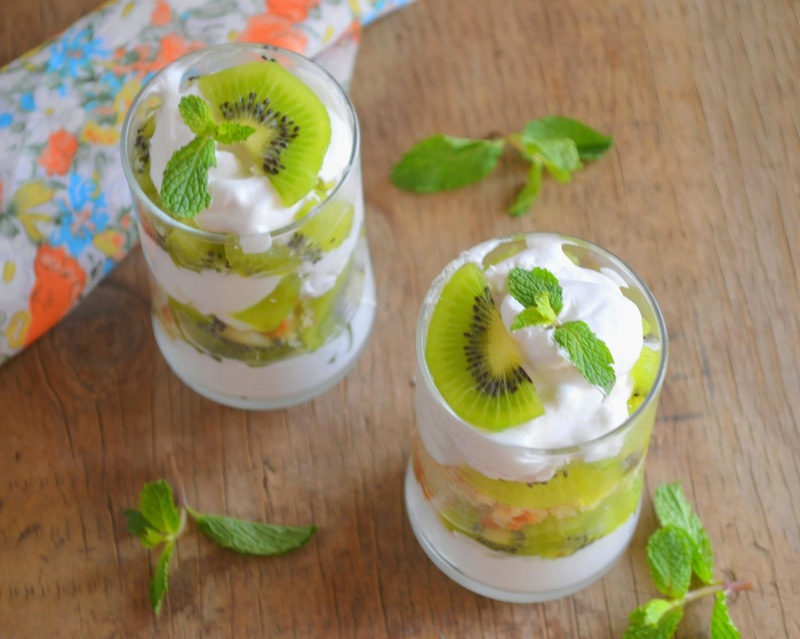 Why just kiwi, make it macerated strawberries or fresh mango. You can make about 6-10 servings depending on how much cake you like in the trifle. As you can see there is more cream here but I added cake again later as more of cake and less of cream tastes way better. You are better off having a little extra syrup or cream on hand rather than fall short while assembling. Fatless sponge: recipe here . Add a generous 2-3 teaspoons zest to the sponge batter in place of the coffee. Or use your favorite sponge or savoirdi, just be sure it holds syrup well without going pasty. Chill the beaters and the bowl in which you will whip the cream for atleast ½ an hour. Take a large bowl filled with ice. Place the chilled cream in the cold bowl and sit this bowl in the larger bowl of ice. Whip the cream till medium peaks form. Fold in the zest and vanilla. You can make this ahead of time and refrigerate. Syrup : Heat the water and sugar till the sugar dissolves. Take off the heat, add the juice and vanilla. Cool. Taste as you go. Assemble : Fill the cream in a pastry bag. Tear the sponge into one inch bits. Place in a wide bowl and spoon the syrup over the cake to moisten thoroughly. Drain any extra syrup. Layer as you wish in glasses or in a large glass bowl. Use cream judiciously, just enough for contrast . Cake first, cream and fruit. Repeat with more cake. If you put the cream in first, it looks pretty, but you may end up using more of it. Pipe with a decorative tip or spoon more cream on top. Cover with cling wrap, refrigerate at least overnight. Longer is even better. 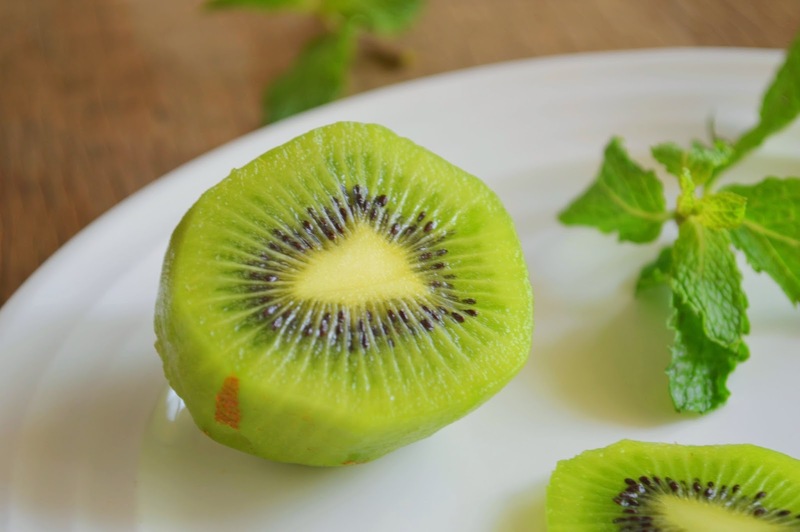 Serve garnished with kiwi slices and a sprig of mint. Please note : Kiwi fruit is sweet when soft and ripe, mine could have been more ripe. Check this. Try heating a couple of tablespoons of cream, take off the heat, stir in the zest. Cover and let infuse for a few minutes. Strain and add to the remaining cream, chill and whip. Will do this next time. Looks super delicious and tempting.. great clicks too!! 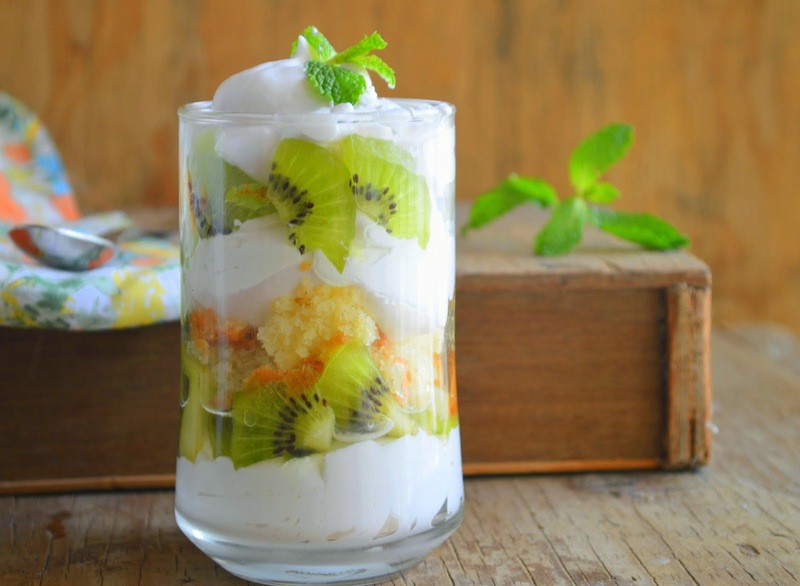 Hard to resist to this luscious dessert.Delicious summer trifle with my favourite Kiwi.